I first learned about string art while watching a Buzzfeed Nifty video. During the video, I watched a person wrapping a string around nails to make beautiful patterns. 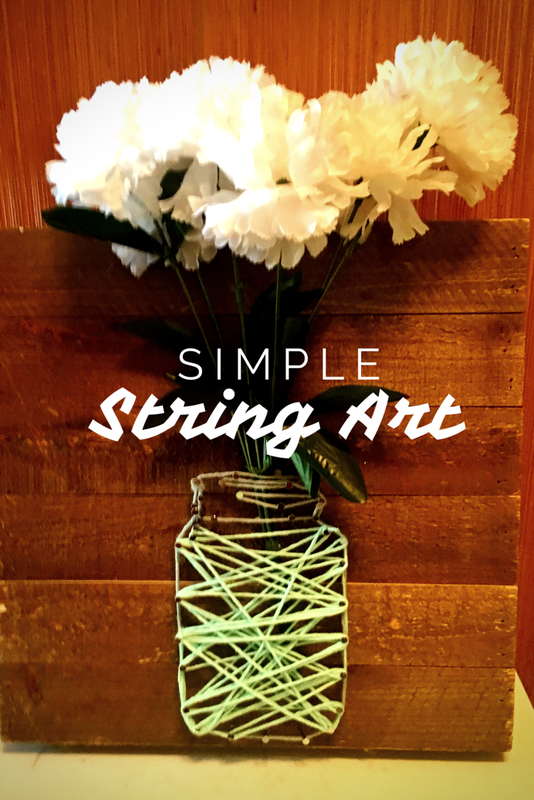 I instantly fell in love with the idea of using string to make art and added it to my project “to do” list. Months went by and I never got around to doing the string art project. One day I was looking on Pinterest for ideas to decorate some mason jars. 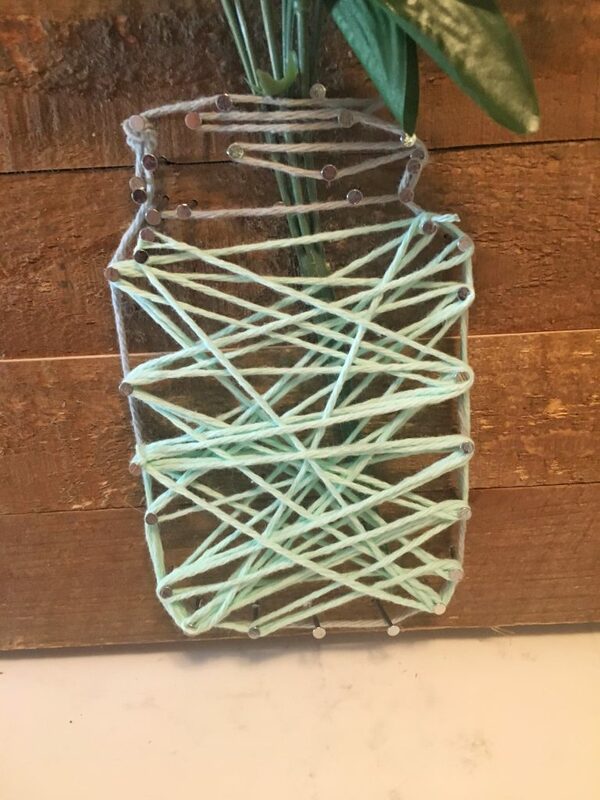 I came across a mason jar made with string. After seeing that craft, I decided to finally make my own string art. 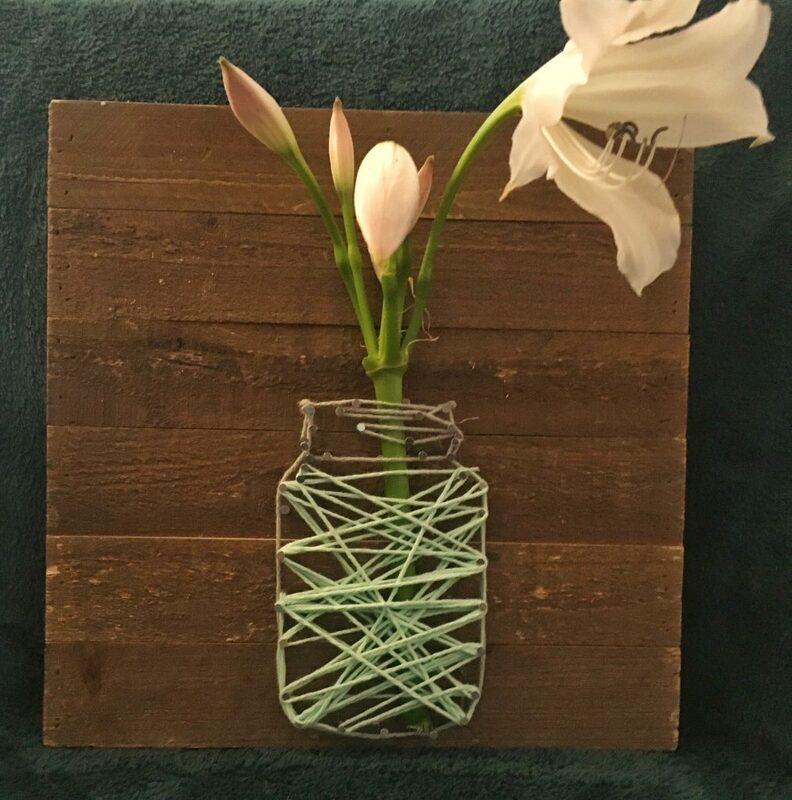 I love the way vases and jars made of string look with flowers coming out of them. A month ago I bought all my supplies for string art. I laid out my wood, setup my pattern, pulled out the first nail to hammer and it was terrible. I had forgotten that I’m quite terrible with a hammer. So, the project was put to the side. Then during my Craft Challenge on my Instagram and Facebook page, a very good friend and follower challenged me to try string art. I sighed when I got this request but promised my followers that I would complete or attempt to complete all challenges given to me. After a few failed nailing attempts that resulted in the purchase of sharper nails, I finally got my nails to go into the wood. Once the nails are in the wood, the stringing part goes by quite quickly. I did the base of the mason jar in gray yarn and then filled in the middle with a light teal yarn. 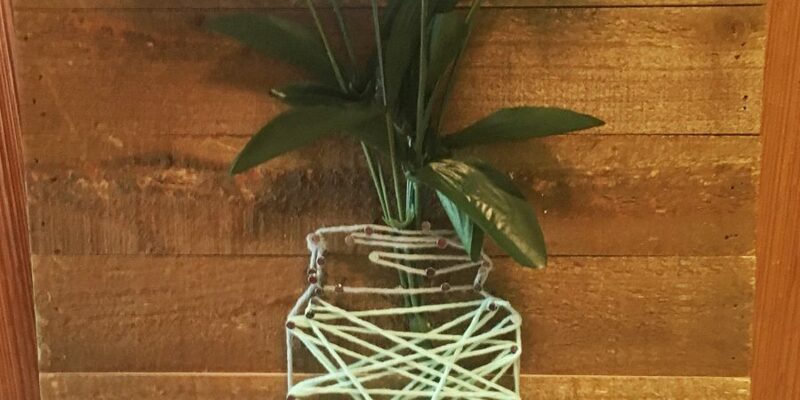 A little background on string art, according to Wikipedia it was created in the 19th century by Mary Everest Boole to make mathematical concepts more accessible to children. Strings were used to help kids understand straight and curved lines. Then in the 1960s string art turned into a craft. The craft has recently become a trend again. 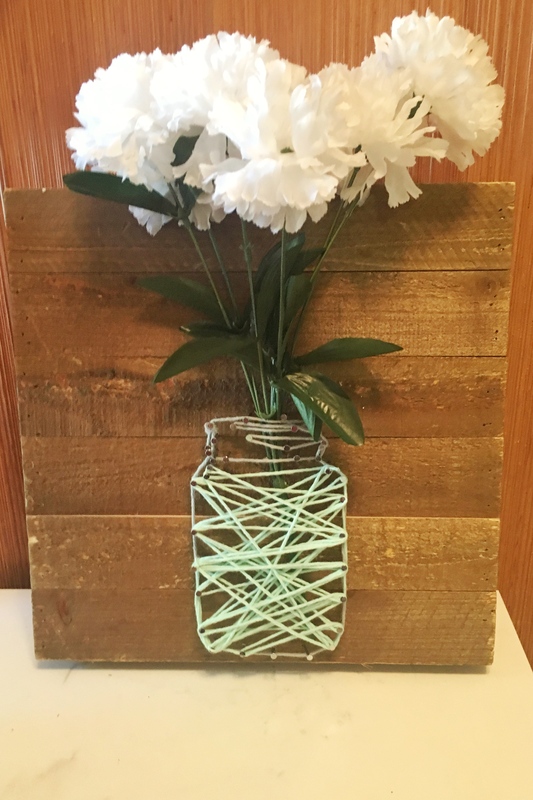 I’ll walk you through the steps I used to create my string art below. These steps can be applied to any template. Wood. Large enough for your mason jar. Print your mason jar template Mason Jar template. Cut the template out. Decide where on the wood you want the mason jar. Begin hammering in the nails. Make sure you allow enough space to insert your flowers. Nails should stick out of the wood about 1/4 to 1/2 an inch. Once all nails are in, tie a knot in the yarn to the nail in the number one spot. Pull the yarn to each number. 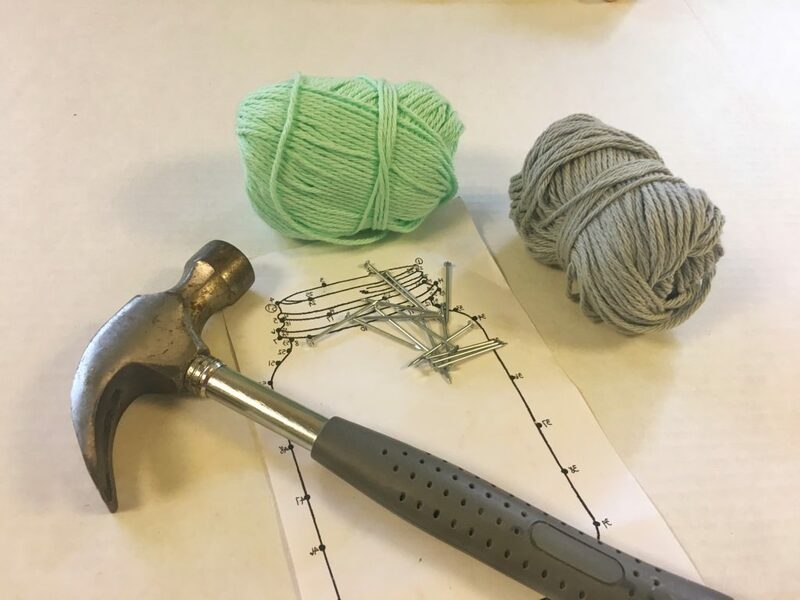 Remeber to keep the yarn at the top of the nail. 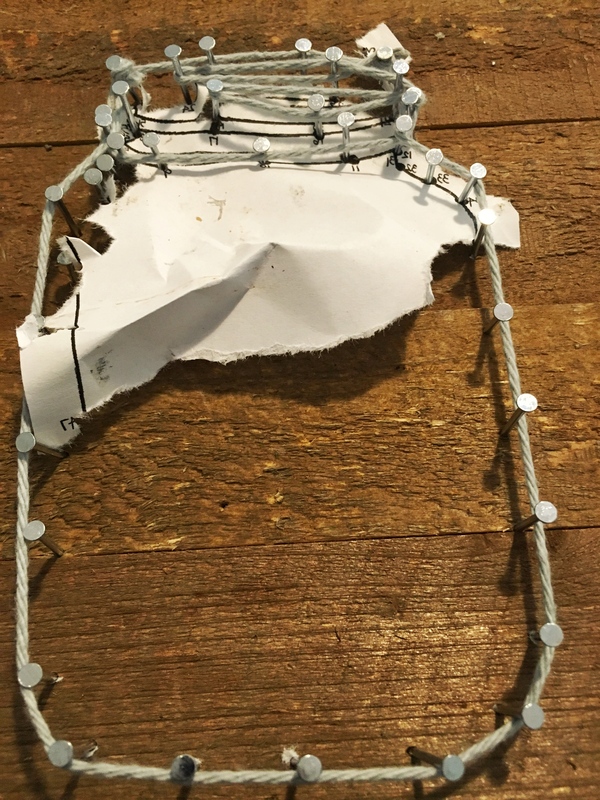 Once you get to Number 57, tie a knot and cut the string. Please note: Some numbers share a nail. So you will be going back around and wrapping the yarn on the other side of the nail. Please note: Some numbers share a nail. So you will be going back around and wrapping the yarn on the other side of the nail. 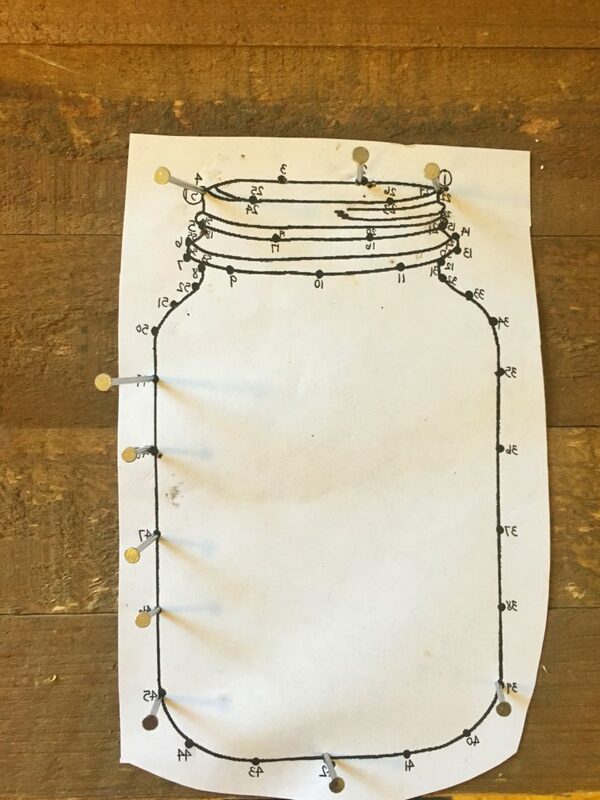 Carefully remove the mason jar template from the board. Slowly rip it off. 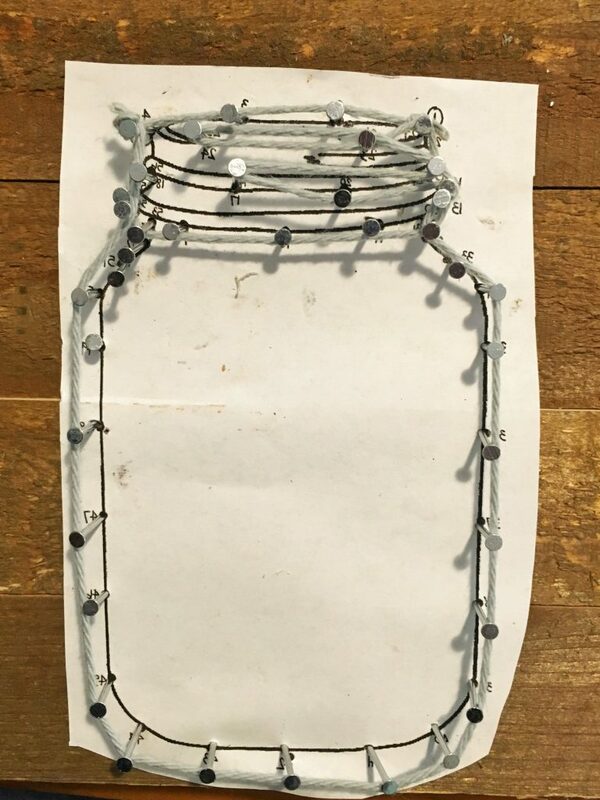 So, at this point, you can leave your mason jar as is OR you can take yarn (the same color a different color) and tie it to a nail and start pulling the string between nails. This adds additional color and design to the project. BE CREATIVE and have fun with this part. Add your flowers to the jar. Hang or display and enjoy your new art piece. Do you have a craft that you’ve given up on? Hopefully, my story helps you overcome your fear or hesitation of completing a challenging craft. Please comment below to let me know how your string art project went. Wow!! This looks so cool!! I definitely making one for my living room! Cool project to take up! You seem to be really talented! Nice artwork!